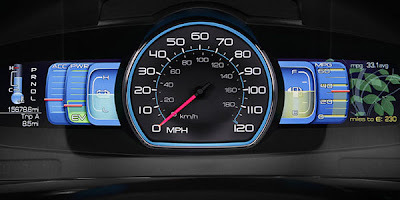 Notice anything green at the right of this dash display? Ford and Smart Design have released a prototype for the dashboard of the future — an electronic display that uses iconic visual representations to convey information clearly, without distracting, so you don’t crash the car. One of the nice touches is a fuel-efficiency symbol at right. Ford research showed consumers often want to get a “high score” for mileage, so the display uses an organic symbol of growing leaves to convey your impact on the planet. Go easy on the gas and the leaves bloom; accelerate hard and the leaves wither and die. Clever.